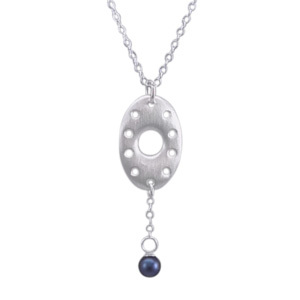 This design was created as a mother-child pendant... A midnight blue pearl hangs from a sensuous silver Open Oval. The round opening at the center of the oval is echoed by the shape of the pearl. The sterling silver oval represents the mother, and the pearl her children. It is is 7/8" high x 1/2" wide, and comes on a 16" sterling silver chain.